I have a lot of fun pushing the face and makeup editor in Blue Mars to its limits, and what I find I love most about it so far is how easily I can translate some of my real life makeup tricks into my virtual makeup looks. This applies particularly well to contouring– using a dark powder to shade certain areas of your face in while using a lighter powder to bring out other features. It's a bit of an optical illusion to sculpt your features in a more flattering way. For example, if you shade in the sides of your nose and highlight the bridge, it gives the illusion of a slimmer nose. All the techniques for contouring your real face can be used in Blue Mars by creating and adjusting a few new makeup layers. It will give you a more distinct look and allow you to emphasize your favourite facial features. It even helps add depth and detailing to the default skin, which I'm wearing in the picture on the left. So how is it done? Like making any makeup layer, you just click "New". In most cases a soft oval shape is all you'll need, and you'll also want to click the "Symmetry" checkbox so your makeup layer will be reflected onto the other side of your face. From there, just fiddle with the shape and placement of each layer until you have the desired effects. Shading will work best if the shape is brownish, while highlights should be white, and both usually look their best at about 20-30% Alpha. Personally, I normally wear shading in the hollows of my cheeks, while I highlight my browbones and cheekbones. You might also want to experiment with highlighting your chin and the bridge of your nose, and shading your jawline. 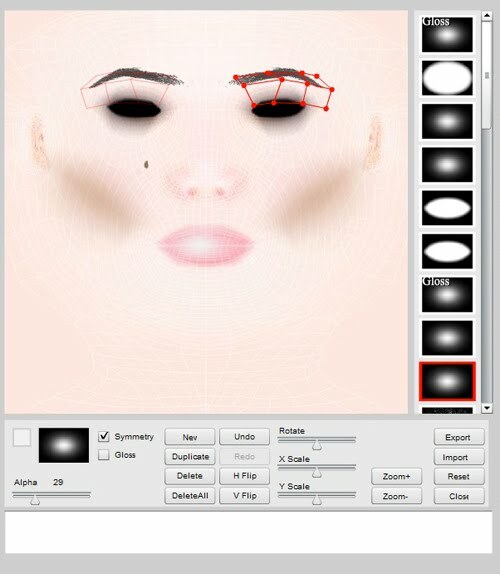 They will all give different effects with varying degrees of subtlety, but if you take customizing an avatar as seriously as I do it's definitely worth it to roll up your sleeves and try your hands at contouring! Do you have a real life makeup technique that you've brought to your Blue Mars face? Send me an email or leave a comment!